To find out where the existing network of salt bins are located visit www.wandsworth.gov.uk/snow. The additional salt bins are to be stationed at key locations across the borough so that residents have a ready supply of grit close at hand if they decide to clear snow and ice from footpaths around their homes. The new bins should appear across neighbourhoods within the next few days, bringing the total number in the borough to 40. Twenty salt bins were placed on street corners towards the end of last year ahead of the recent cold snaps. Their success and popularity among residents has prompted the council to double their number. 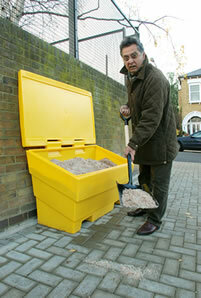 Each bin contains one tonne of grit or salt for residents to use. These are repeatedly refilled during icy spells. They have been placed in areas most badly affected by icy weather like hilly parts of the borough and also near to schools, hospitals and old people’s homes. As well as introducing salt bins, the council supplied more than 200 neighbourhood watch co-ordinators with between 50 and 100 kilos of salt for use in their streets during the last cold snap. The council has echoed the Government’s guidance to residents about clearing ice from footpaths. Visit www.direct.gov.uk/en/Nl1/Newsroom/DG_191868 for more information.